In a very straight forward definition 3D, imaging is the process to create optical illusion of depth on a 2D display. This goal can be achieved by reproducing a pair of slight different images in a way that viewers’ eyes see each image separately, creating the depth illusion as their brains combine the images into a single one. In next post we’ll experiment acquiring stereoscopic images and see how to create this optical illusion of depth with them. To better understand the process, first lets see a fast review of how the human brain notices depth by presenting some cues extracted from the optic involved in human vision system. Depth perception arises from a variety of depth cues and are classified into binocular cues that require input from both eyes and monocular cues that require the input from junt one eye. Here I`ll present a subset of these clues from both classes, monocular (Motion Parallax, Accommodation, Occlusion and Shading) and binocular (Stereopsis and Vergence). Motion parallax is the event occurred when the apparent relative motion of stationary objects against a background gives hints about their relative distance. One clear example of such effect can be seen while driving a vehicle. The closer the object is, the faster its apparent movement while more distant objects appear almost stationary. Accommodation defines the effect of the ciliary muscles movements for focusing on far away or closer objects. These movements can make the eye lens thinner. 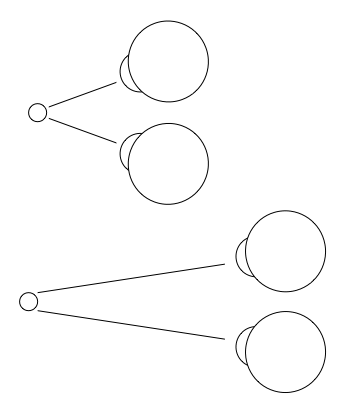 Occlusion of objects by others can provide information about relative distances and allow the creation of a “ranking” of relative distance based in the object`s geometry. The way that light falls on an object and reflects off its surfaces, and the shadows that are cast by objects provide an effective cue for the brain to determine the shape of objects and their position in space. By using two images of the same scene obtained from slightly different angles, it is possible to use this information to judge the depth of a scene with a high accuracy. 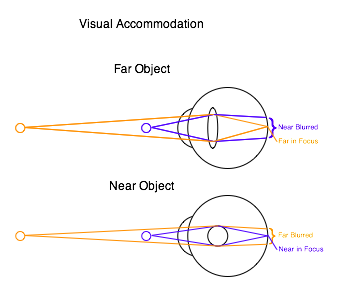 The closer the object is, the large will be the disparity while more distant objects will have a smaller one. These effect is often used in magic eyes Books, 3D movies and stereoscopic images. In our stereo vision the two eyes focus the same object and doing so they converge. The information about how much they converge for focusing an object can be retrieved by the stretch of the extra ocular muscles and used for depth perception. Again, the closer the object is, the large will be the angle of convergence, while far way objects will be noticed by smaller angles. So, this was a quick overview about how the human eye can notice depth from some cues. In next post I’ll present to you some techniques used to construct digital stereoscopic images and the available devices to experience this depth illusion in 2D displays. And also how to construct your own stereoscopic image quick and easy.